Handar’s 40G QSFP+ transceiver modules are designed for use in 40 Gigabit Ethernet links over single mode fiber. 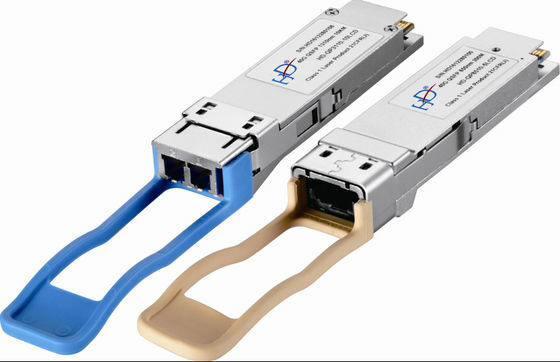 They are compliant with the QSFP+ MSA1 and IEEE 802.3bm 40GBASE-ER42. Digital diagnostics functions are available via an I2C interface, as specified by the QSFP+ MSA. The transceiver is RoHS compliant per Directive 2011/65/EU3. Data Rate Specifications Symbol Min Typ Max Units Ref. Compliant with 40GBASE-ER4 and XLPPI per IEEE 802.3bm. Tested with a PRBS 231-1 test pattern. Per 40GBASE-ER4, IEEE 802.3bm. Links longer than 30km are considered to be engineered links, with losses less than the worst case specified for the fiber type. From power-on and end of any fault conditions. After internal AC coupling. Self-biasing 100W differential input. 10 MHz to 11.1 GHz range. Hit ratio = 5 x 10E-5. RIN is scaled by 10*log(10/4) to maintain SNR outside of transmitter. Minimum value is informative, equals min TxOMA with infinite ER and max channel insertion loss. Compatible with SFF-8436 (QSFP+ MSA)1. Handar’s QSFP+/40G transceivers have an operating temperature range from 0°C to +70°C case temperature. Environmental Specifications Symbol Min Typ Max Units Ref. Handar’s QSFP+/40G transceivers are RoHS-6 Compliant. Handar’s QSFP+/40G transceiver modules are Class 1 laser eye safety compliant per IEC 60825-1.